Third-party data presented to users within Apple Maps may soon include local gas prices and school locations, thanks to new partnerships with GasBuddy and GreatSchools. 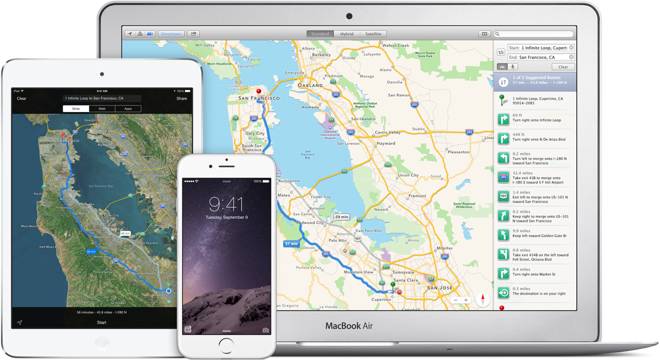 The new data sources for Apple Maps were recently added to Apple's official acknowledgement page for its iOS and OS X mapping solution. Their appearance was first discovered on Wednesday by AppleMapsMarketing. Though gas prices and school information are not yet shown when searching on Apple Maps, the deals with GasBuddy/OpenStore and GreatSchools would suggest that Apple plans to integrate the information at some point in the future. Another minor addition to the Maps partner list is the National Land Survey of Finland Topographic Database. Big things are expected for Maps in 2015, whether Apple ties those updates to its anticipated iOS 9 update or otherwise. In particular, Maps in its current state lacks transit data, but that's expected to be addressed thanks to Apple's acquisitions of HopStop and Embark. Other areas where Apple is expected to expand its mapping service are crowdsourced traffic information and indoor location tracking— areas hinted at by acquisitions and patent filings made by the Cupertino company. Last year, Apple bolstered Maps by adding 10 new sources for business listings. They were DAC Group, Location3 Media, Marquette Group, Placeable, PositionTech, SIM Partners, SinglePlatform, UBL, Yext, and Yodle. The initial business data for Maps, when it first launched, came from Yelp, Factual, and Neustar/Localeze. Apple's featured Maps partner is TomTom. Update: Apple also added business listings data from Yext and mapping data from Land Information New Zealand in its latest Apple Maps update.